(2 June - Cropchoice News) -- The Scottish National Farmers Union has bumped into an ally with deep pockets in the controversy over Advanta's contaminated canola in Europe. 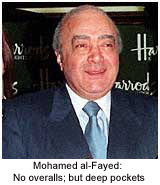 It turns out that Anglo-Egyptian entrepreneur Mohamed al-Fayed, proprietor of the famous Harrods department stores, owns a Scottish farm where 55 acres of Hyola 38 canola were planted. The variety is illegally contaminated with a small amount of glyphosate-tolerant seed. The British Agriculture Minister has advised farmers to destroy the crops; but has not offered any compensation. British farm groups are considering legal action. A spokesman for al-Fayed says the businessman is "furious" and "outraged" about the contaminated canola, which has no market in Europe. Scottish National Farmers Union President Jim Walker confirms al-Fayed has offered to pay legal costs of a lawsuit to seek compensation for farmer's losses . Walker says "It's quite nice to know somebody of his alleged wealth would back us." Although al-Fayed probably won't be driving any tractors, acreage planted in Hyola 38 in Scotland appears likely to be destroyed. The Scottish National Farmers Union has not announced if it will proceed with any legal action.